The Healing of a Centurion’s Servant. The centurion’s interaction with Jesus mediating for the healing of his servant gives us great lessons of Christianity. The Gentile military officer was a man of love in action, a model of faith in Jesus, and an icon of humility. Jesus praised him and set him as an example for people who were around Jesus at that time. While practicing our religion as Christians, let us also be loving, caring, believing, and humbling like the centurion. (Matthew 8:5) When he entered Capernaum, a centurion approached him and appealed to him, (6) saying, “Lord, my servant is lying at home paralyzed, suffering dreadfully.” (7) He said to him, “I will come and cure him.” (8) The centurion said in reply, “Lord, I am not worthy to have you enter under my roof; only say the word and my servant will be healed. (9) For I too am a person subject to authority, with soldiers subject to me. And I say to one, ‘Go,’ and he goes; and to another, ‘Come here,’ and he comes; and to my slave, ‘Do this,’ and he does it.” (10) When Jesus heard this, he was amazed and said to those following him, “Amen, I say to you, in no one in Israel have I found such faith. (11) I say to you, many will come from the east and the west, and will recline with Abraham, Isaac, and Jacob at the banquet in the kingdom of heaven, (12) but the children of the kingdom will be driven out into the outer darkness, where there will be wailing and grinding of teeth.” (13) And Jesus said to the centurion, “You may go; as you have believed, let it be done for you.” And at that very hour [his] servant was healed. The evangelists Matthew (8:5-13) and Luke (7:1-10) give the same event with slight difference. Matthew who wrote the gospel for those with Jewish background gives importance to the teachings that follow after the event. Luke who wrote for the Gentiles gives more details of the event demonstrating the faith of this Gentile centurion. Jesus came down after his long sermon on the mountain at the northwestern shore of the Sea of Galilee. (Matthew chapters 5-7). From there he moved to Capernaum. On his way he cured a leper. (Matthew 8:1-4). In Luke’s gospel Jesus came to Capernaum after his Sermon on the Plains. (Luke 6:20-49). Capernaum is known as “The town of Jesus” because he did most of his ministry in that village. Though Jesus grew up in Nazareth when he started his public ministry there, his own people rejected him and even tried to throw him down the hill (Luke 4:28-30). He overcame that assassination attempt and moved to Capernaum to make it as his base for preaching and serving the needy. He did most of his public ministry there. Out of his 12 apostles, Peter, Andrew, James, John and Matthew where from Capernaum. It had roads that lead to different cities and so a hub were Jesus could meet many people. Though a small village, it was part of Galilee where most of the Jews lived. In spite of the great preaching and miracles of Jesus in Capernaum, that city lacked enough faith and Jesus cursed it. (Matthew 11:23). During the public ministry of Jesus, Jews were under the Roman rule. Their military presence was all over the nation. Centurions were military officers who were in charge of 100 soldiers each. (Centuria in Latin means 100). Four centurions are mentioned in the Bible. All of them are presented as good characters. Two of them are associated with Jesus, one with St. Peter and another with St. Paul. 1. The centurion who requested Jesus to heal his paralyzed servant. (Matthew 8:5-13 and Luke 7:1-10). According to the elders of Jews, he deserved the favor from Jesus because he loved the Jewish nation and had built the synagogue for them. (Luke 7:3-5). Besides a man of charity, he became an icon of humility and faith in Jesus. 2. Another centurion whose name is also not mentioned was the one in charge of the crucifixion of Jesus. Pilate assigned him to supervise the crucifixion because the Jews had no authority to carry out the death sentence of Jesus. The centurion noticed the extraordinary signs that happened at the crucifixion of Jesus. “When the centurion who stood facing him saw how he breathed his last he said, ‘Truly this man was the Son of God!’” (Mark 15:39). Thus he, like many others, proclaimed the divinity of Jesus. 3. In Acts chapter three we see an exemplary centurion. “Now in Caesarea there was a man named Cornelius, a centurion of the Cohort called the Italica, devout and God-fearing along with his whole household, who used to give alms generously to the Jewish people and pray to God constantly.” (Acts 10:1-2). He had divine vision. He and his family were the early Gentile converts to Christianity who received baptism from St. Peter. 4. Julius of the Cohort Augusta was another centurion who was in charge of Paul and some other prisoners who were shipped to Rome. During the shipwreck, this man began to trust Paul and prevented his fellow soldiers from killing all the prisoners. (Acts 27:43). Though Matthew presents that the centurion approached Jesus direct, Luke reports that he never met Jesus in person. First he sent elders of the Jews and in the second phase, he sent his friends because he might have considered himself unworthy to come in front of Jesus. The reason for this can be better understood if we look at another event in the Acts. St. Peter had a vision and then three people came to see him. They said, “Cornelius, a centurion, an upright and God-fearing man, respected by the whole Jewish nation, was directed by a holy angel to summon you to his house and to hear what you have to say.” (Acts10:22). When Peter entered the centurion’s house, Peter said, “You know that it is unlawful for a Jewish man to associate with, or visit, a Gentile, but God has shown me that I should not call any person profane or unclean.” (Acts 10:28). Such Jewish law and custom might have been there in the humble mind of the centurion who approached Jesus for healing his servant. He expressed that in the Gospel of Luke: “I did not consider myself worthy to come to you.” (Luke 7:7). He believed that Jesus had supernatural power to heal his servant from a distance. Though Matthew uses the term servant, Luke uses the word slave. There was no much difference between slaves and servants during Biblical times. They were the property of the owner and not like contract workers of hired men. If a servant is seriously sick, the owner could abandon him and could buy another one. However, the centurion kept him at home for medical treatment and considered him as a family member. The love and humanitarian approach of the centurion towards his slave was appealing to Jesus. Besides paralysis, the centurion adds saying his servant was suffering dreadfully. Luke does not specify the sickness but says “a slave who was ill and about to die, and he was valuable to him.” (Luke 7:2). This description by the Evangelist adds to the good character of the centurion. It shows the pain shared by the master and his great concern for the cure. Without any further questioning or discussion, Jesus volunteered to go to the house of the centurion. Usually a Jew, especially a Rabbi, won’t go to the house of a Gentile. Jesus wanted to be with the sick servant and the family to offer them compassionate care without caring that the centurion was a Gentile and Jews were not allowed to make such visit. Jesus goal was action with compassion. (8) The centurion said in reply, “Lord, I am not worthy to have you enter under my roof; only say the word and my servant will be healed. The centurion, out of respect, did not call Jesus by name. Instead, he calls him Lord. He considered himself as unworthy for Jesus, the Lord, to enter his house because Jesus is a Jew and an extraordinary Rabbi with divine power. The centurion believed in the power of the Words of Jesus. He might have heard how Jesus used to perform miracles. His words had made miracles happen though the centurion was not fully aware at that time that Jesus was the Word that took the human flesh. The centurion acknowledged that he was under the authority of the Roman emperor and other superiors before he mentioned his authority over the soldiers under his command. That was also an expression of his humility. When he added “I too,” he also expressed his faith that Jesus was under the authority of God and compared his situation with that of Jesus. As a centurion, he had 100 soldiers who were subject to his authority. They were supposed to strictly obey his commands. The centurion clarified his logic of why he believed that Jesus could heal his servant from a distance with only his word. From experience, the centurion knew the power of his word. All the soldiers subject to him obeyed his commands even from a distance. He need not be physically present to implement his wishes. So also Jesus, who had authority over the nature and whatever caused illness, could command and cure his servant from where Jesus was. (10) When Jesus heard this, he was amazed and said to those following him, “Amen, I say to you, in no one in Israel have I found such faith. There are only two instances when Jesus is reported as amazed at the response of others. One was the faith expressed by this centurion and another was at the negative reaction of his natives in the synagogue of Nazareth. When he taught there, his listeners were astonished and were doubting on his authority because they knew him and his family. Instead of appreciating him and thanking God for his power, they took offense at him. Mark the Evangelist reports that Jesus “was amazed at their lack of faith.” (Mark 6:6). Another instance where Jesus was amazed at the faith of a person was at the reply of a Greek woman who was Syrophoenician by birth at Tyre. When she pleaded to heal her daughter who was possessed with unclean spirit, Jesus tested her saying, “Let the children be fed first. For it is not right to take the food of the children and throw it to the dogs.” Her reply was: “Lord, even the dogs under the table eat the children’s scraps.” (Mark 7:27-28). Though the term “amazed” was not used, Jesus was astonished at the reply of this Gentile woman and healed her daughter. (Mark 7:24-30). There were many who were accompanying Jesus after his sermon on the Mount to hear more from him and to witness the wonderful things he was doing. Jesus made use of the opportunity to teach them from what they heard direct from the centurion. Amen means acceptance or affirmation. In the Bible it was used at the end of a prayer, blessing, curse or statement expressing one’s endorsement or truthfulness of what was said. For example, when Ezra opened the scroll and blessed the LORD, all the people raised their hands high and pronounced, “Amen, amen!” (Nehemiah 8:5-6). In Deuteronomy 27:14-26 the Israelites were asked to answer “amen” to the 12 curses pronounced by the Levites at Mount Ebal. By that, they were accepting the curses that would fall on them if they would violate the laws that God gave them through Moses. Amen stands for Truth and in that sense it is used in the Bible as title of God. One of God’s title is “The God of Amen” or God of Truth. (Isaiah 65:16). In Revelation 3:14, Jesus is presented as: “The Amen, the faithful and true witness, the source of God’s creation.” The Holy Bible ends with “Amen” expressed by St. John the author of the Book of Revelation. (Rev. 22:20-21). Jesus used the Hebrew word, “Amen” at the beginning of a statement, or even twice as “Amen, Amen, I say to you.” (John 3:3). The meaning is “truly, truly, I say to you” or “I solemnly tell you the truth.” By these statements, Jesus was affirming the truthfulness of what he was going to say. Jesus compared the awesome faith of the Gentile centurion with that of the chosen people of Israel. Israelites, especially Jews, had the privilege of God’s protection, guidance by Moses, Joshua, judges, and kings, teachings and correction from the prophets and the presence of God in the Tabernacle. However, they could not accept the Messiah when he came. They were not practicing the faith in their life compared to the centurion. Even his disciples of Jesus took time to understand Jesus and his kingdom. The centurion was a secular person, a Gentile, a military officer, and a person with no understanding of the Hebrew scriptures. However, Jesus appreciated his faith and declared it as far better than anyone in Israel. The following were the good characteristics of the centurion presented by Matthew and Luke. 1. The centurion was a lover of enemies. Jews were in opposition with the Romans. Rome appointed the centurion to keep them under control. Instead of threatening them, he had good relations with them. That was why the elders of the Jews came to Jesus on behalf of him pleading to save the life of his slave. They told Jesus: “He deserves to have you do this for him, for he loves our nation and he built the synagogue for us.” (Luke 7:4-5). 2. The centurion had a great respect for the True God of Israel. He expressed that by even constructing a synagogue for them. 3. The centurion, was exceptional that he was considering his slave not as an object, but as one of his family members. He took the pain of his slave as his own and tried all his best for the slave’s cure. When every worldly medication failed, he approached Jesus for help without considering what others might think of him. 5. Jesus appreciated the expression of the centurion’s faith. He believed in the power of the Word of God. He believed that Jesus could heal his slave even from a distance. He compared his position as a person under authority and above soldiers assigned to him. So also, he believed in the authority Jesus had from God and his authority over everything else in the universe. The redemptive ministry of Jesus is for all. However, Jesus used the term “many” implying that only who accept him and his message will be saved. At the Last Supper, Jesus said to Thomas: “I am the way and the truth and the life. No one comes to the Father except through me.” (John 14:6). According to God’s promise to Abraham, “All the families of the earth will find blessing in you.” (Genesis 12:3). Jesus was fulfilling this promise and presenting centurion as an initial example of such people who would find salvation through him. The east and west represented all directions of the world. This was a reminder of Isaiah 45:6, “all may know, from the rising of the sun to its setting, that there is none besides me.” So, people from all the nations, including those who live far away, are invited to the Kingdom of God that Jesus established. That was why Jesus said to his apostles, “Go into the whole world and proclaim the gospel to every creature. Whoever believes and is baptized will be saved; whoever does not believe will be condemned. (Mark 16:15-16). So the Kingdom of God is not restricted to any nation but open to all on condition that they belive in him and get baptized. This was in contrast to the understanding of the Jewish leaders and teachers of the time. In the Biblical times, people used to enjoy banquet relaxed and in a reclining position. There are several references of reclining for eating during Jesus’ public ministry. Abraham, Isaac, and Jacob were the patriarchs of the Old Testament who worshipped the true God. The Bible uses the formula “The God of Abraham, Isaac, and Jacob” in several places because God referred Himself as the God of Abraham, Isaac, and Jacob. God told Moses: “This is what you will say to the Israelites: The LORD, the God of your ancestors, the God of Abraham, the God of Isaac, and the God of Jacob, has sent me to you. This is my name forever; this is my title for all generations.” (Exodus 3:15). The Jews also use the same formula or “The God of our forefathers” in their prayers. This reminded them of the covenant that God made with Abraham (Genesis 12:1–3) and reaffirmed with Isaac (Genesis 26:3–4), and Jacob (Genesis 28:14–15). Jesus compared the joy of the Kingdom of heaven like a banquet that is enjoyable, relaxed, and involves good friendship. However, Jews used to exclude Gentiles from their banquets. For example, when Peter went to Jerusalem, “the circumcised believers confronted him, saying, ‘You entered the house of uncircumcised people and ate with them.’” (Acts 11:2-3). When Jews used to avoid eating with the Gentiles, Jesus taught that people from all nations including Gentiles would recline at the Table of the Lord in heaven while many chosen people of Israel would be cast out. The Jews would hate to hear such teachings from anyone. The Israelites considered themselves as the children of God (Deut. 14:1). They distinguished themselves as distinct from the Gentiles who did not worship the God of Abraham, Isaac, and Jacob. So the Israelites believed that the inheritance in the kingdom of God would be only for them. According to St. Paul, “through faith you are all children of God in Christ Jesus. … And if you belong to Christ, then you are Abraham’s descendant, heirs according to the promise.” (Galatians 3:26-29). Those Israelites who rejected Jesus were losing their divine inheritance and the Gentiles who accepted Jesus were becoming children of God. The Israelites were driven out from their God-given land of Canaan by the Assyrian and Babylonian attacks and subsequent exile because they disobeyed God and committed sin. The same history would repeat by rejecting the gospel of Jesus, the God incarnate. They would be replaced with the Gentiles who would repent and accept the Kingdom of God. Paul and Barnabas, while in Antioch in Pisidia, boldly addressed the Jews who were opposing them saying: “It was necessary that the word of God be spoken to you first, but since you reject it and condemn yourselves as unworthy of eternal life, we now turn to the Gentiles.” (Acts 13:46). Thus, the Jews who were supposed to be heirs of God’s kingdom were excluded. According to the Bible, darkness is the absence of spiritual light and the domain of the evil. Jesus, the Light of the World, came to rescue us from the darkness of sin and the influence of the evil. He commissioned his disciples to continue that mission. Addressing King Agrippa, St. Paul said that Jesus sent him “to open their eyes that they may turn from darkness to light and from the power of Satan to God, so that they may obtain forgiveness of sins and an inheritance among those who have been consecrated by faith in me.” (Acts 26:18). To Colossians St. Paul wrote of Christ: “He delivered us from the power of darkness and transferred us to the kingdom of his beloved Son.” (Colossians 1:13). While Jesus was rescuing many from darkness, those who rejected him were remaining in darkness and they would be driven out into eternal darkness at the final judgement. This phrase is found in several places in the Bible. Wicked person gnash their teeth against the righteous as an expression of their hatred or anger as in the case of the trial of St. Stephen. (Acts 7:54). Psalm 37:12 states: “The wicked plot against the righteous and gnash their teeth at them.” Jesus used this in association with the final judgement. “Thus it will be at the end of the age. The angels will go out and separate the wicked from the righteous and throw them into the fiery furnace, where there will be wailing and grinding of teeth.” (Matthew 13:49-50). The grinding of teach along with wailing is an expression of great and lasting anguish at the loss of everlasting life in heaven. It is also an expression of their great disagreement in seeing others, like Gentiles and former sinners, enjoying eternal reward with the forefathers Abraham, Isaac, and Jacob. (13) And Jesus said to the centurion, “You may go; as you have believed, let it be done for you.” And at that very hour [his] servant was healed. 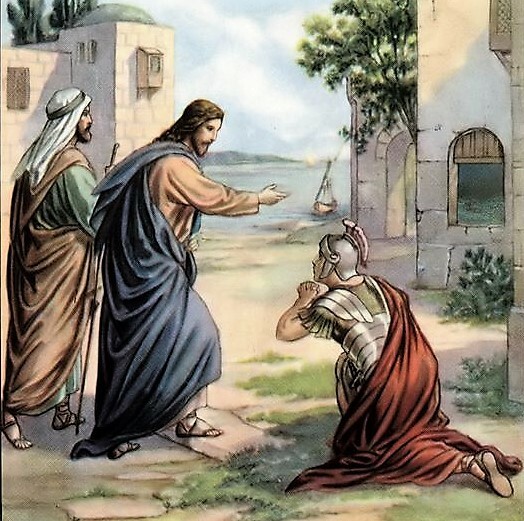 Jesus did not insist to go to the house of the centurion. Through his response, Jesus confirmed the faith of the centurion in the power of the Word of Jesus. Without any touching, prayer, or blessing, Jesus healed the servant from a distance. The evangelist confirms that the servant was healed. 1. Profession and Religious Practice: Though the centurion was by profession a Roman military officer, he was a godly man. He had faith in the God of the Israelites. That was why he built synagogue for them. He also showed many qualities of a religious person. Regardless of our profession, we can all practice our faith. There were many Christian saints and martyrs who were secular professionals. 2. Charity in Action: The centurion was a man of charity. Besides helping the Jews who considered centurions as their enemies, he showed unusual concern for his sick servant. He took care of the servant at his home as a family member. He even humbled himself to reach out to Jesus as a last resort. Let us, like the centurion, put into practice the commandment of love in our lives. 3. Humility: The humility of the centurion is another lesson that we need to learn from him. Even after 2,000 years, his statement, “Lord I am not worthy to receive you under my roof … “ is repeated as a liturgical prayer during the Latin Mass. 4. Faith: Jesus could find more faith in the Gentile Centurion than even among the Jews. He believed that Jesus could heal his servant even without coming to his house. And it happened as he believed. While, keeping our faith, let us hand over that to our next generation and ask God to increase our faith. 5. Rejection of the Children: The chosen people of Israel had deviated from God and rejected Jesus when he came as promised. So they lost their inheritance in the Kingdom of God that Jesus established. Let us be careful that we and our children also do not deviate from God and the teachings of Jesus.